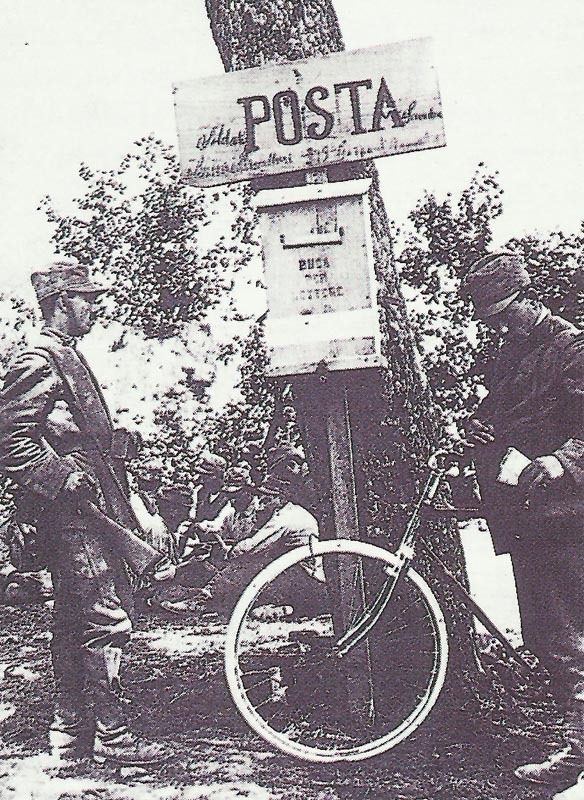 Italian field mailbox behind the Isonzo front. Second Battle of the Isonzo ends with Italian casualties of 41,866 soldiers. Argonne: French repulse German night attacks; German setback at Hill 213. South Poland: Austrian First Army cavalry enter Vladimir Volinski. Aegean: French battleships shell Smyrna, following Spelia and Scanlanova opposite Samos next day as diversion attacks before Suvla Bay landings. Bulgaria: Allies reply to Bulgar note from June 14 with undefined offer. Greece: Allied ultimatum to Greece offers Smyrna as compensation. Italy: Government demands free Italian departure from Anatolia (consuls in Turkey prepare to leave on August 9). Germany: Government learns of Tsar’s third and clinching refusal of its peace overtures. Britain: Treasury appeals for banknotes use, not gold. Army Council officially employ Women’s Legion Cookery Section.